2 What is Globalization to Me – And You? 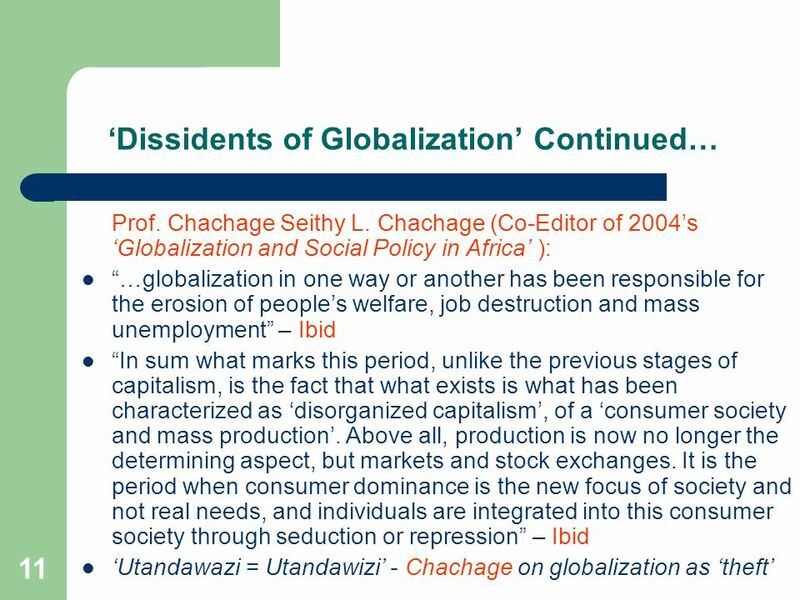 As an ideology or dogma, globalization seems to be a new process. It is conventionally/dogmatically presented as the modern/contemporary way(s) in which the world is becoming a ‘Global Village' as people become more and more integrated and/or interconnected culturally, socially, politically, economically, technologically and so forth. 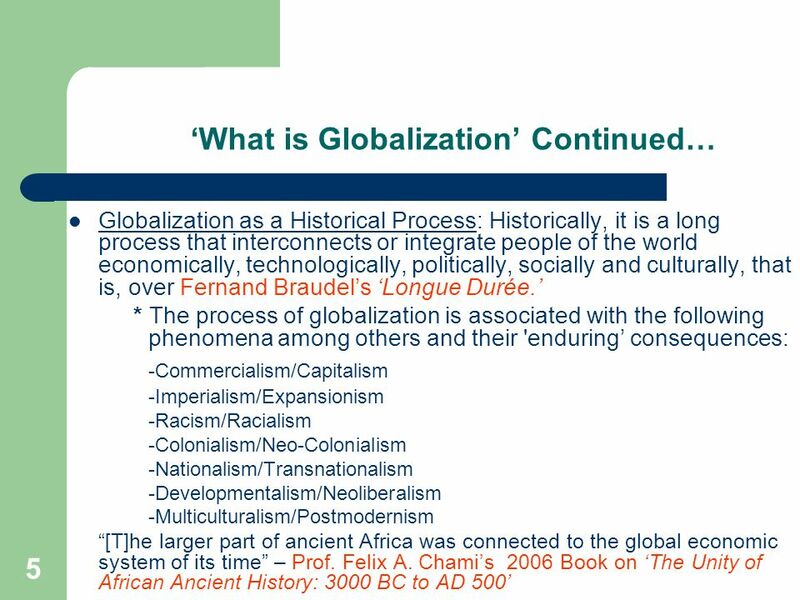 However, as a historical process, globalization is not that new (Cf. 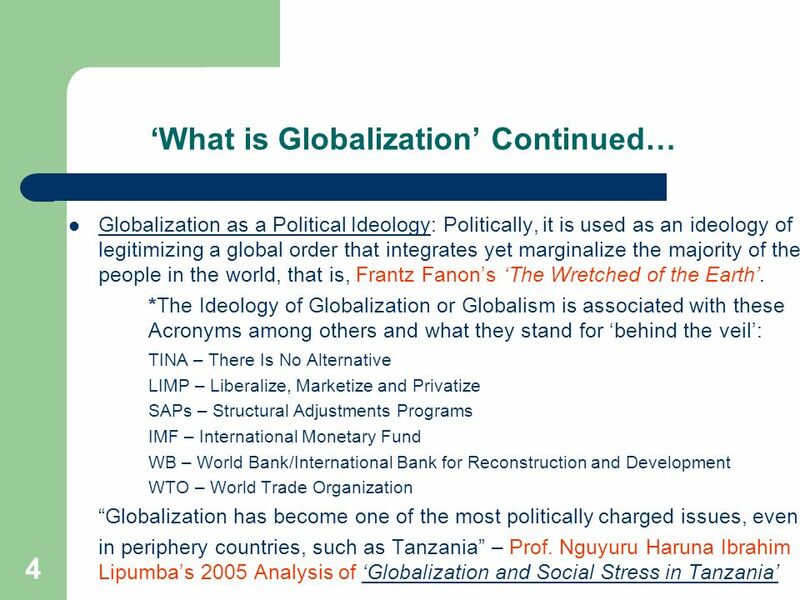 Prof. Paul T. Zeleza’s 2003 Book on ‘Rethinking Africa’s Globalization’). 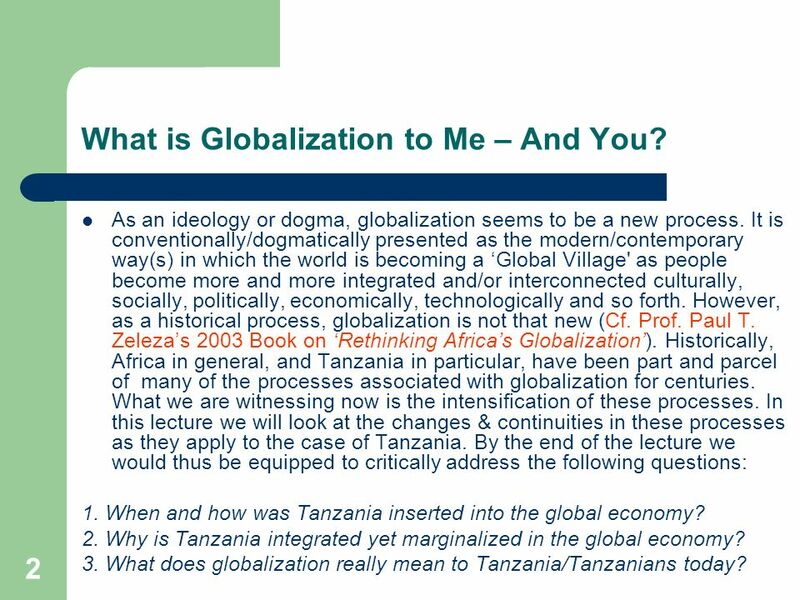 Historically, Africa in general, and Tanzania in particular, have been part and parcel of many of the processes associated with globalization for centuries. What we are witnessing now is the intensification of these processes. 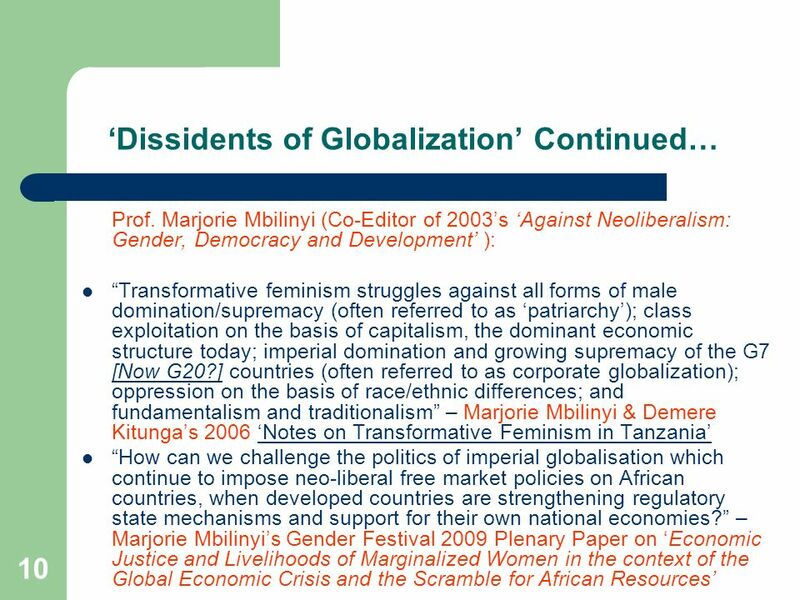 In this lecture we will look at the changes & continuities in these processes as they apply to the case of Tanzania. By the end of the lecture we would thus be equipped to critically address the following questions: 1. 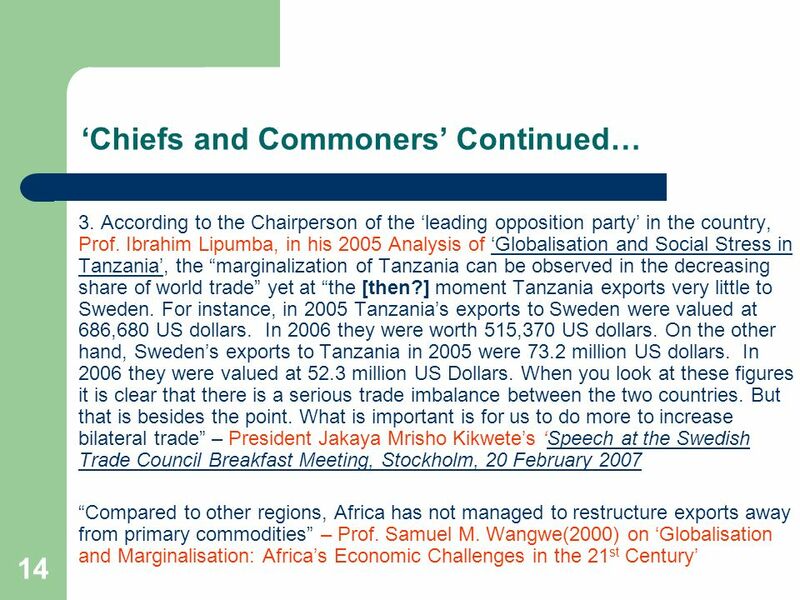 When and how was Tanzania inserted into the global economy? 2. 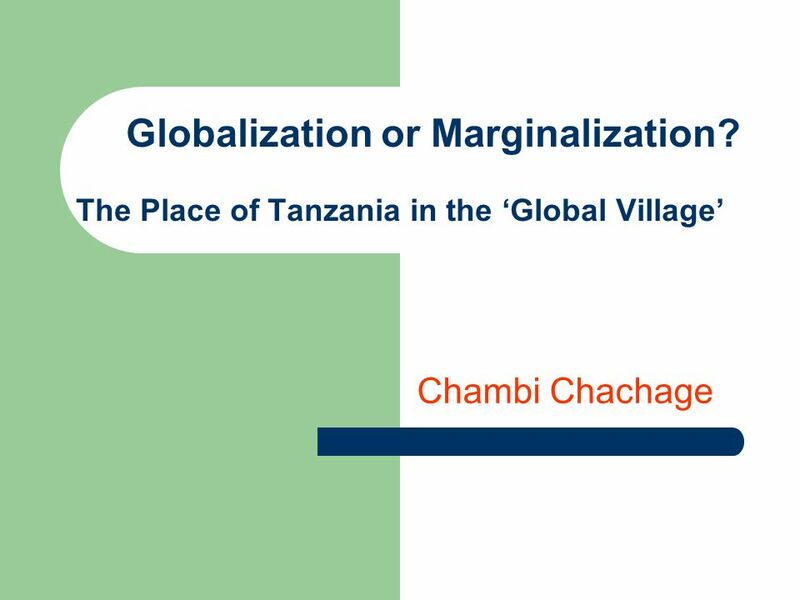 Why is Tanzania integrated yet marginalized in the global economy? 3. 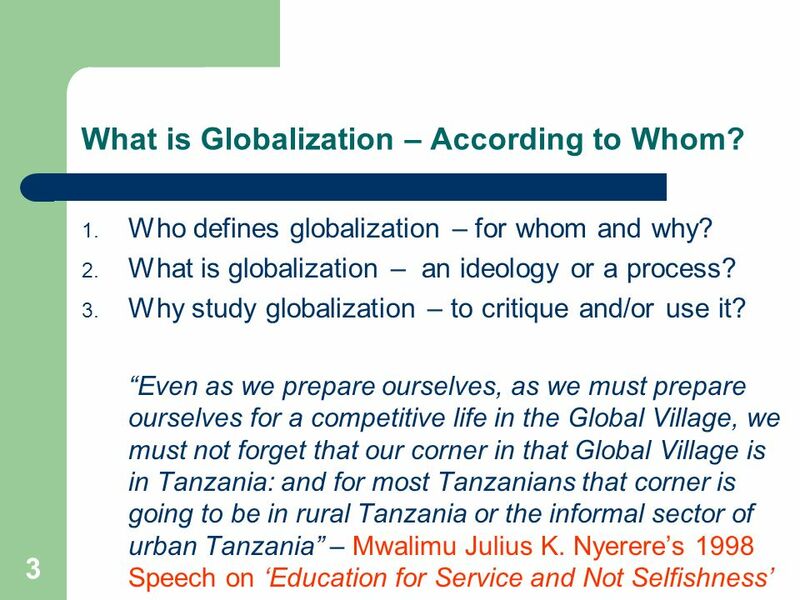 What does globalization really mean to Tanzania/Tanzanians today? 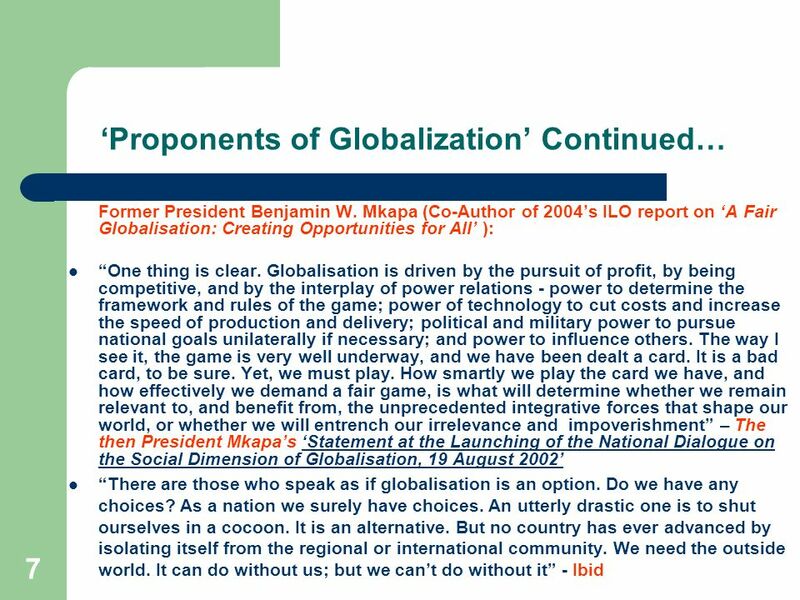 3 What is Globalization – According to Whom? 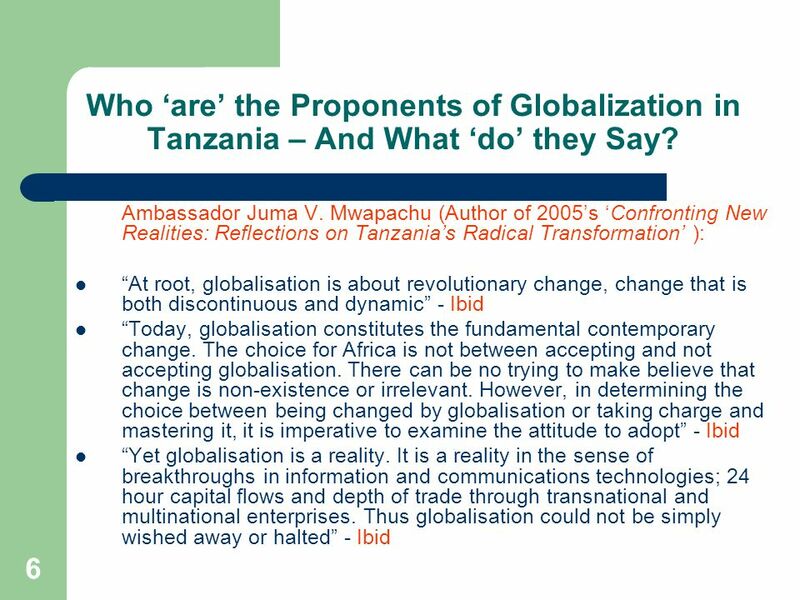 6 Who ‘are’ the Proponents of Globalization in Tanzania – And What ‘do’ they Say? 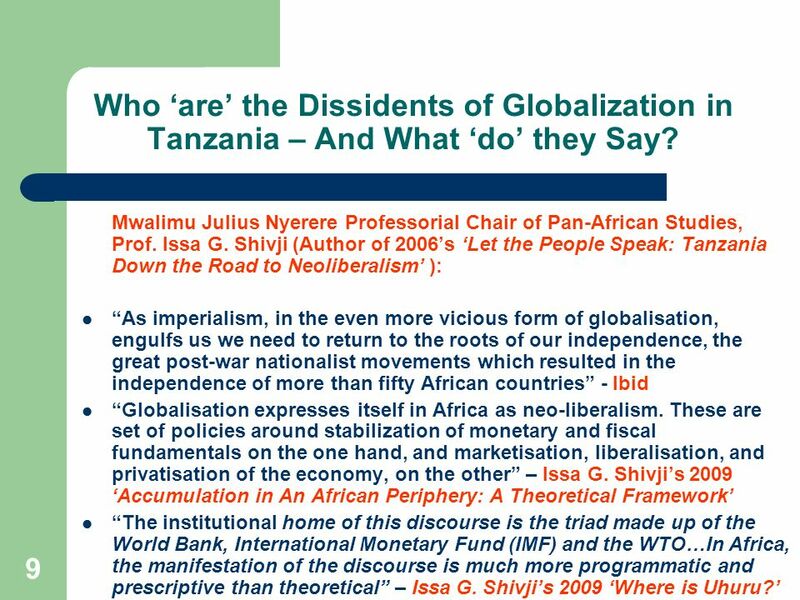 9 Who ‘are’ the Dissidents of Globalization in Tanzania – And What ‘do’ they Say? 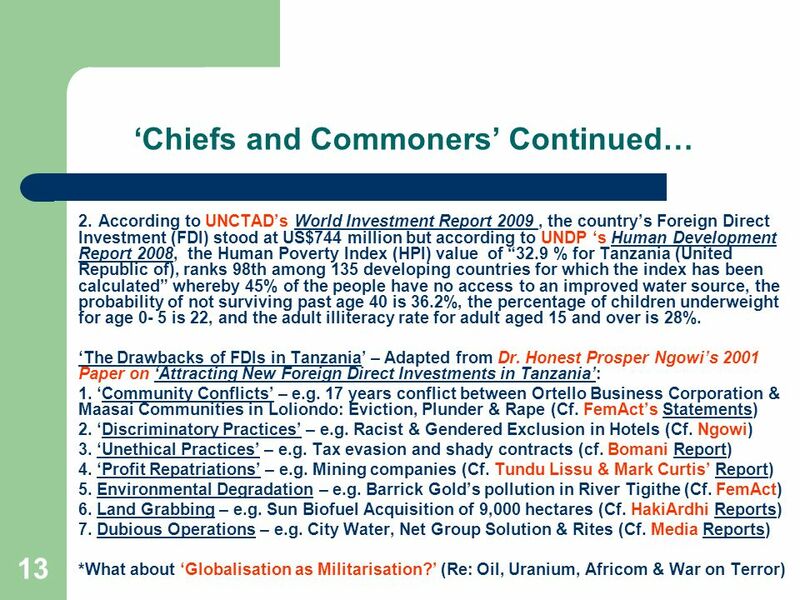 12 Who are the ‘Chiefs and Commoners in the Global Village’? 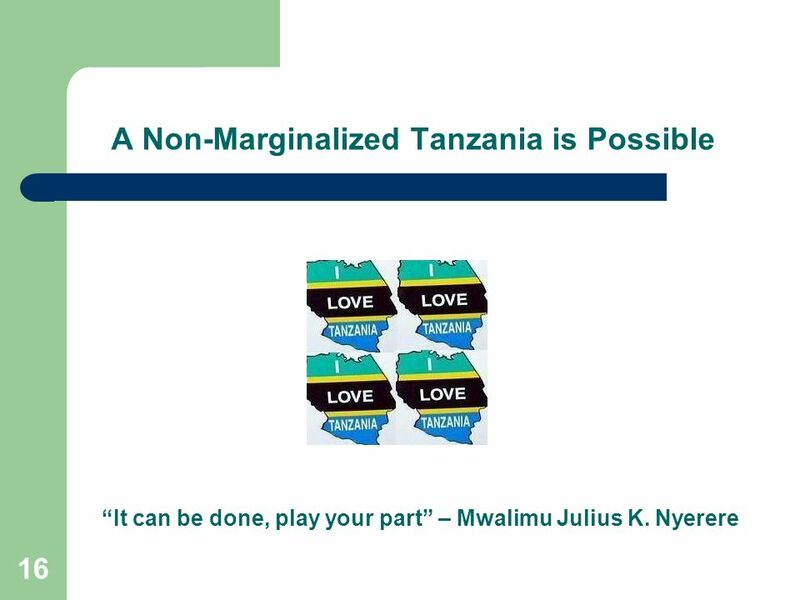 Tanzania is highly integrated yet marginalized in the global system: 1. The country is Africa’s third largest producer of gold but though “ US$2.5 billion in gold has been exported during the past five years, primarily through two major multinationals, Canada’s Barrick Gold, and the South African-based Anglo-Gold Ashanti (AGA), the government has accrued just US$21–US$22 million per annum on average” – Khadija Sharife’s 1 October 2009 Pambazuka News Article on ‘Tanzania’s Pot of Gold’ “Mining has been the most dynamic sector with several new gold mines starting production. The sector has expanded rapidly, averaging growth of around 15% over the period However, the sector contribution to GDP is about 3.7% and, therefore, overall economic growth remains small. 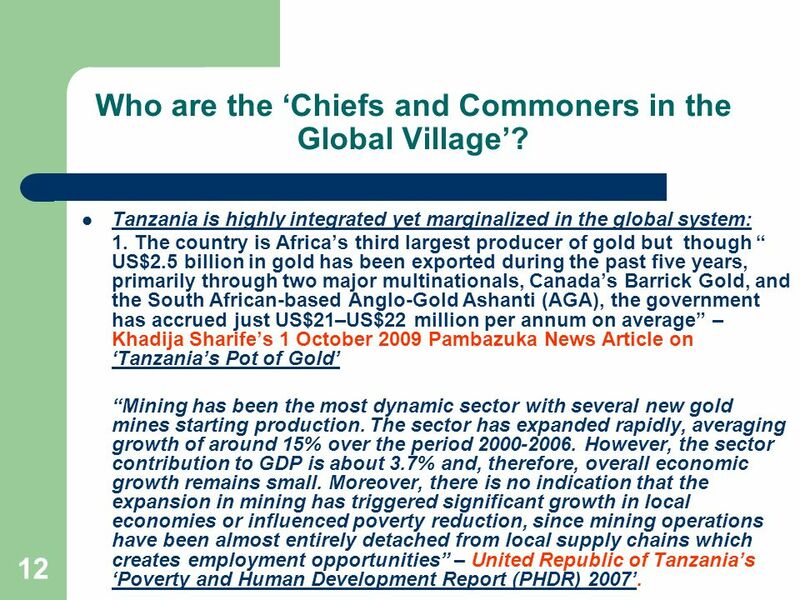 Moreover, there is no indication that the expansion in mining has triggered significant growth in local economies or influenced poverty reduction, since mining operations have been almost entirely detached from local supply chains which creates employment opportunities” – United Republic of Tanzania’s ‘Poverty and Human Development Report (PHDR) 2007’. 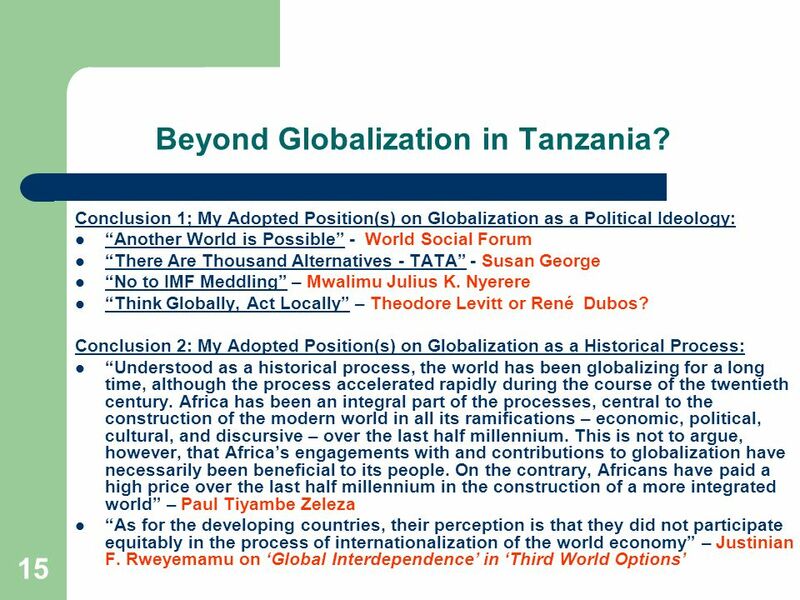 15 Beyond Globalization in Tanzania? 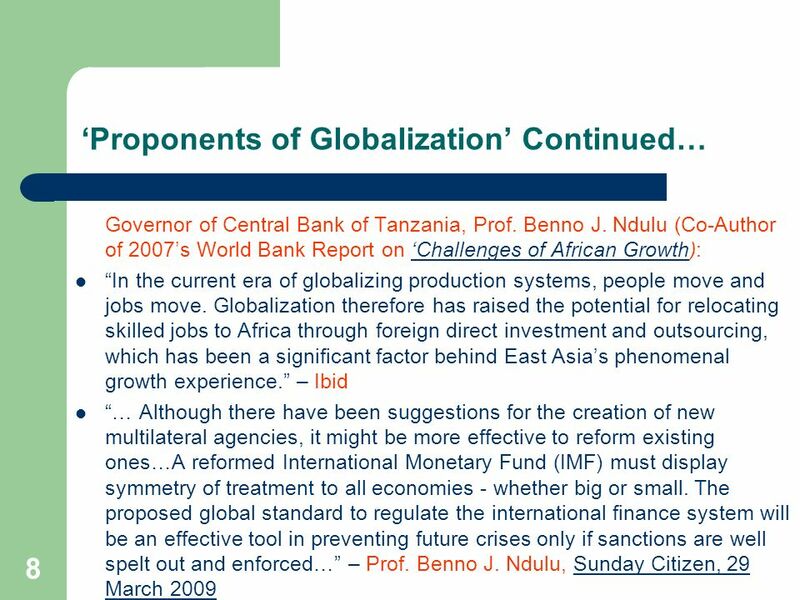 Download ppt "Globalization or Marginalization"
McGraw-Hill © 2007 The McGraw-Hill Companies, Inc. All rights reserved. Slide 1 SOCIOLOGY Richard T. Schaefer The Economy and Work 18. 5 Can Immigrants Solve Canadas Skill Shortage? Dr. Michelle Goldberg 8 th National Metropolis Conference, Vancouver March 25, 2006. Determinants of Foreign Direct Investment in Landlocked and Least Developed Countries- Analysis with a focus to Malawi. Does globalization hurt or help poor people ?